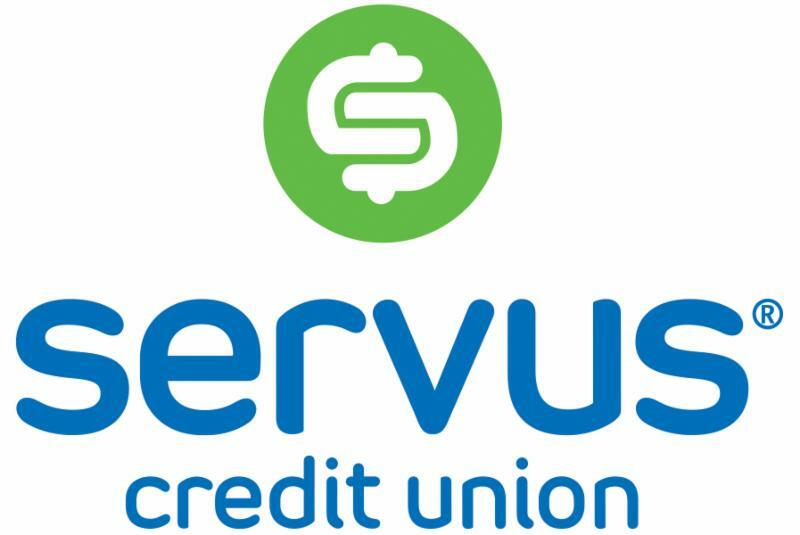 Servus, Alberta's largest credit union, has long had a history of partnering with community organizations. 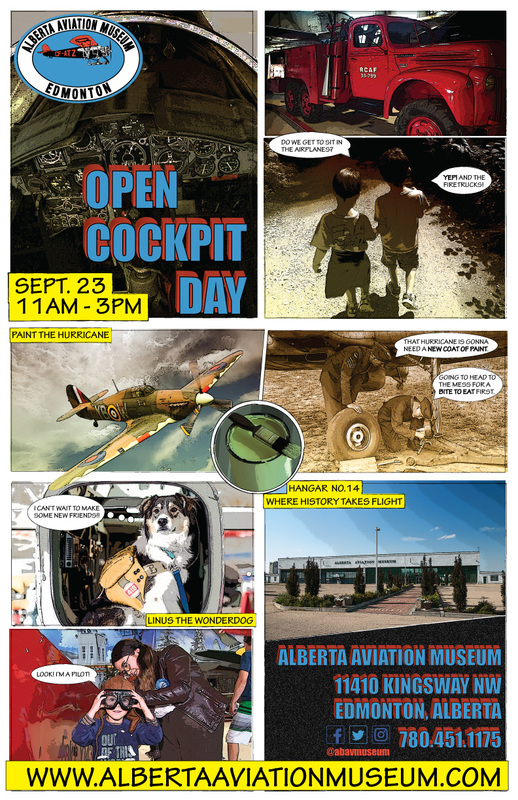 Now the Alberta Aviation Museum is one of them. "We like to look for those hidden gems around the province," says Servus Community Engagement Consultant Scott Lundell. "The aviation museum just came as one of those." Starting in September, Servus will sponsor a Free Access Night from 5 pm to 8 pm on the last Thursday of the month. 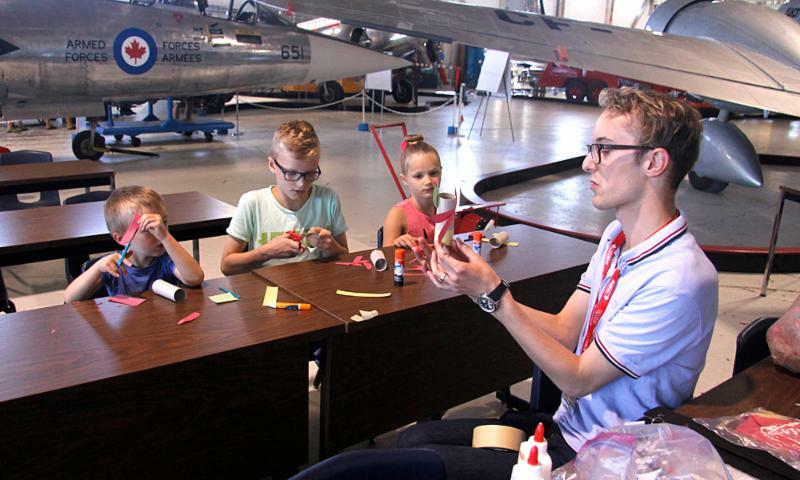 "We help members and the general public experience things they wouldn't normally try out for free in the hopes they can discover something they can enjoy a little bit more," explains Lundell. He says the museum is also an ideal choice because it is right across the street from Servus' Kingsway branch and will give employees at that location some 'ownership' of the partnership. AAM Executive Director Jean Lauzon is delighted to have Servus come on board. "With their strong record of helping Alberta communities and organizations, we are delighted to partner with a company that has such a strong social responsibility. 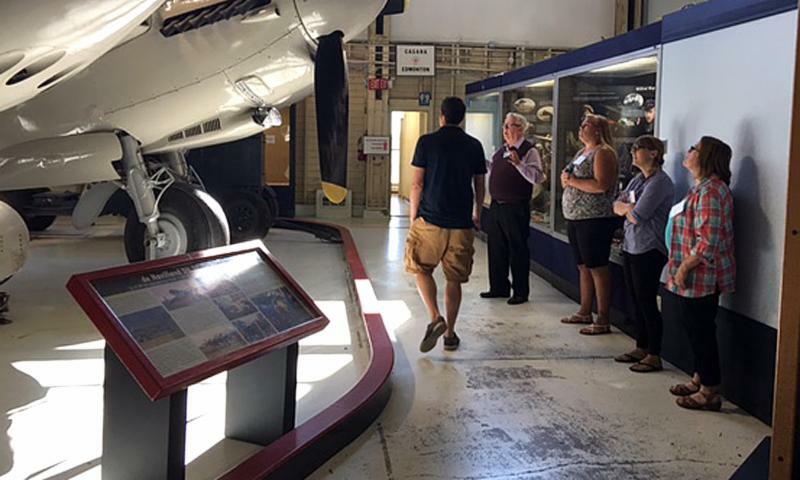 We hope many people will discover our museum through these free access nights and become regular visitors and supporters of our work to preserve Edmonton's rich aviation heritage." Servus and the museum will kick off the partnership on Thursday September 28 at 5 pm. There will be food trucks on site for the opening night. You can find more about Servus's community partnerships here. 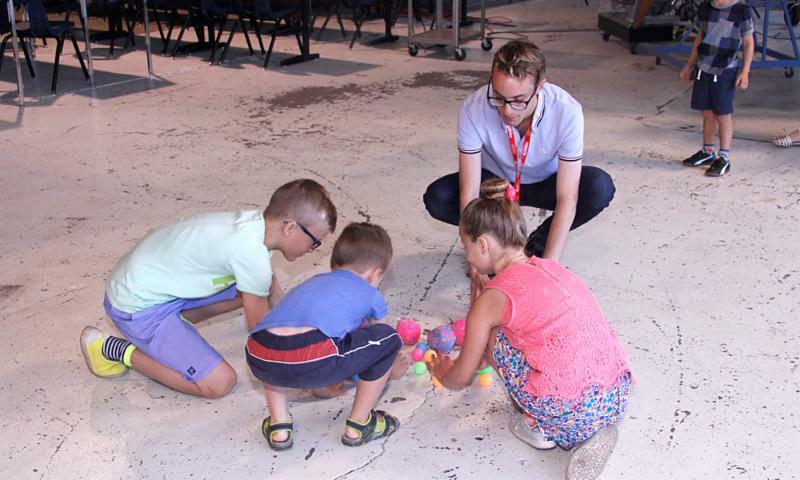 The museum's preschool drop-in program for children 2 to 6 has been enjoying steady success. It began in the spring, running every Wednesday morning, offering young children a chance to learn about topics such as helicopters, bats, spiders and how seeds travel. 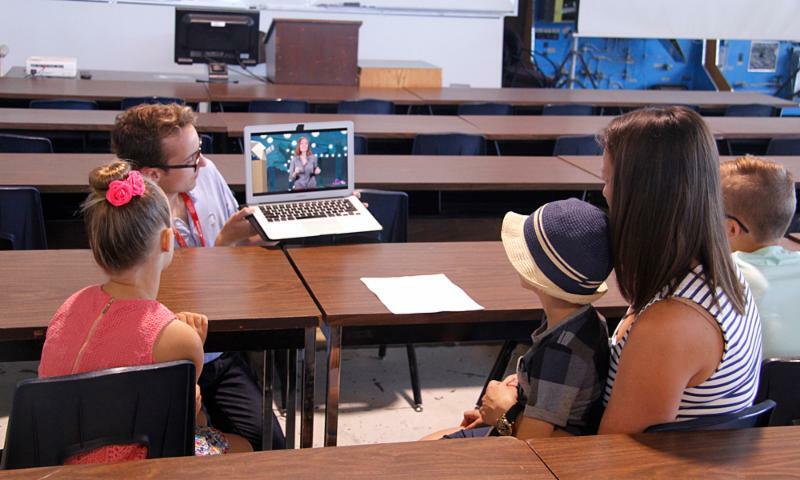 This summer the drop-ins were expanded to Saturday and Sunday. The programs have been developed by AAM Programs Coordinator Ellie McKown and Matthiew Zorzetta-Vermeire, our Canada Works summer student. Each one includes games, crafts and stories geared to younger minds. Almost 130 children have attended the program. "We had a lot of kids in this age group coming through our doors and there was not a whole lot geared for them in the museum," says McKown. "We've had a couple of families that have come back. So to me that shows success because we are getting that repeat." Mack Murray's four-and-a half-year-old son son, also named Mack, took part in a recent weekend program on fireflies and was "happy as a lark" to participate. "When you are that age you can't go around reading the descriptions on the planes. So having someone who can actively make you participate is always great for kids that age." As a result of the positive feedback, the program will continue throughout the year. However, it will be moved to Sunday afternoons, starting September 10 from 1 pm to 2 pm, to make it more accessible for families. 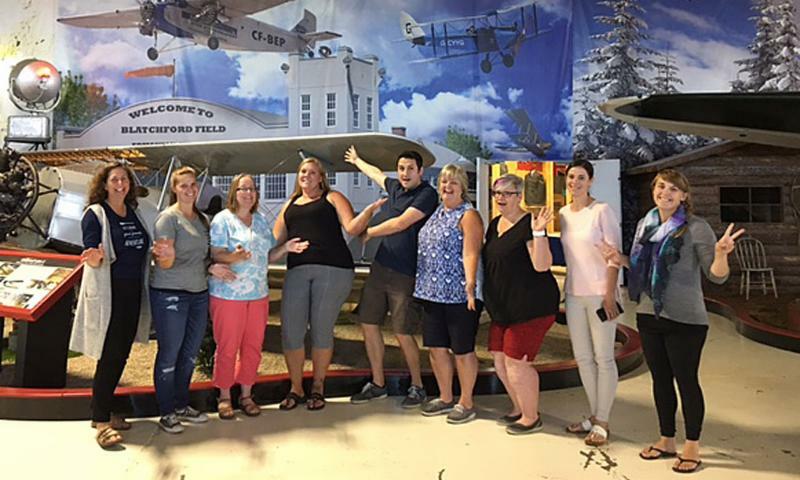 Alberta Education brought together a group of teachers to meet at the museum for two days in August to get inspiration on possible questions for the Grade Six Provincial Achievements Tests. 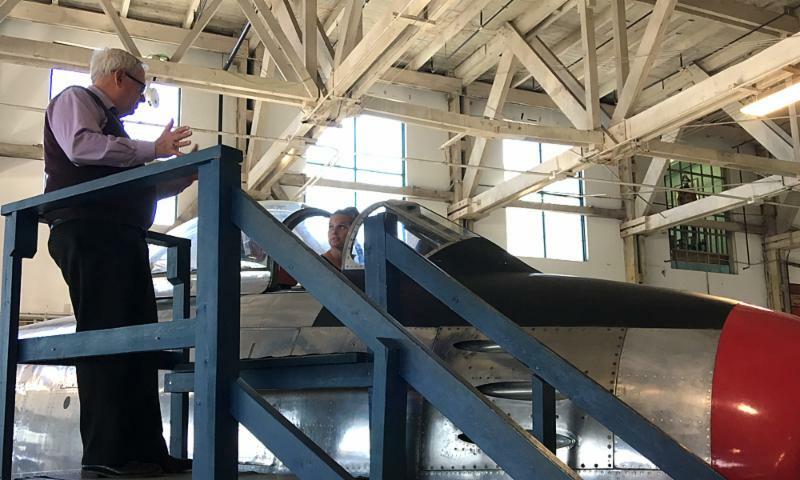 Volunteer Rick McKown gave them a tour of the museum and a chance to sit in the cockpit of the Sabre. Air and Flight is part of the Grade Six curriculum. 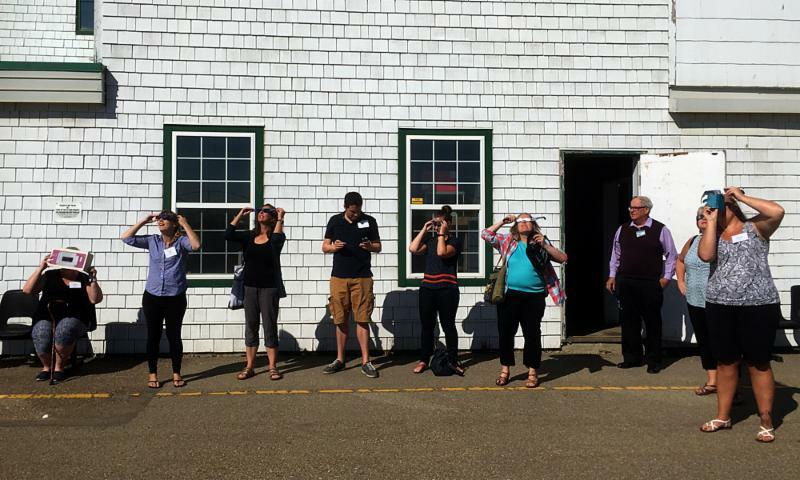 The meeting just happened to coincide with the solar eclipse, so the teachers got a first hand look at another aspect of the Grade Six curriculum. And no visit to the museum is complete without a 'selfie,' this time in front of the Cranwell. We look forward to hosting the group again sometime in the future. 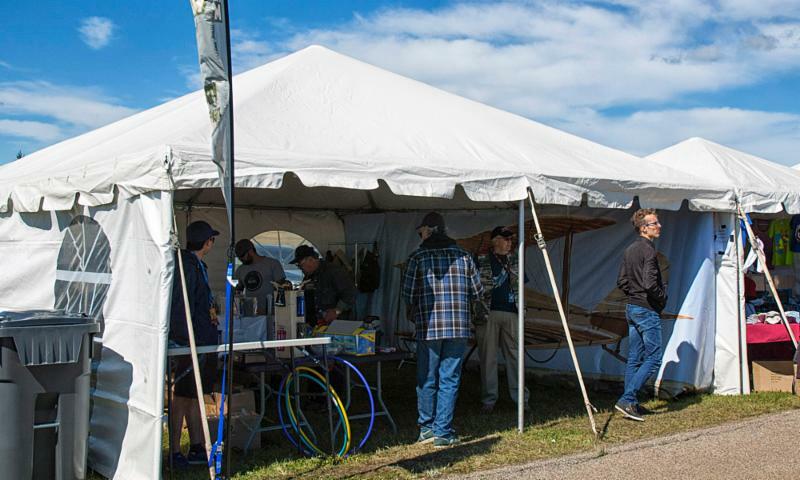 Our tent at the Edmonton Airshow was a great success again this year. We doubled our sales of T-shirts and other gift shop items.Thanks to the staff and volunteers who made it a great weekend. 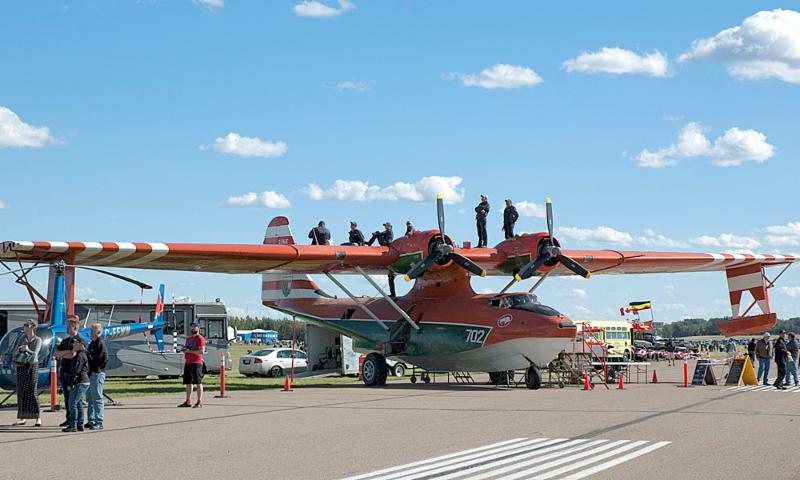 The crew of the Fairview Canso had a perfect vantage point to watch the airshow action...the top wing of their recently-restored WWII flying boat. 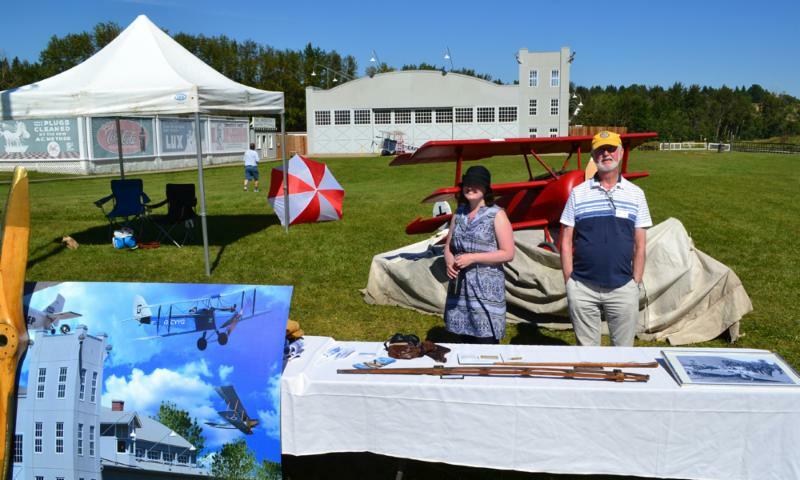 Assistant Curator Ellie McKown and AAM President Rod MacLeod took part in a two days event at Fort Edmonton Park featuring World War I aviation. Curator Lech Lebiedowski also was on hand. 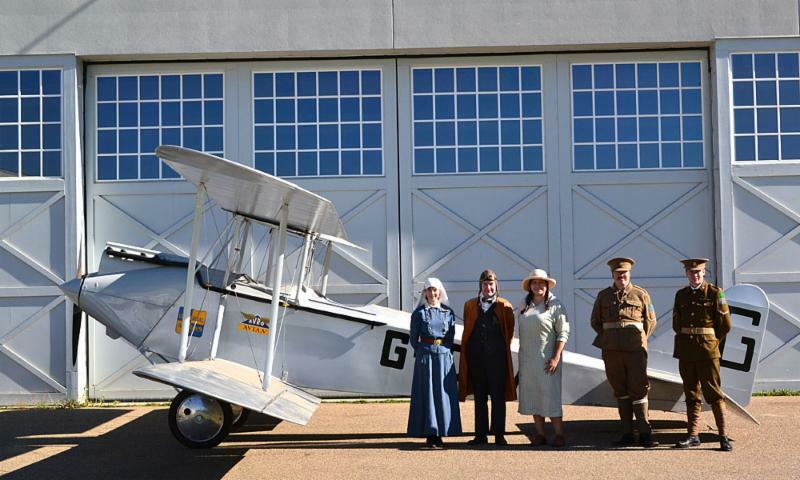 The Fort Edmonton Park interpretive team in front of the Avro Avian replica, which bush-pilot-legend Wop May flew on his mercy mission to Fort Vermillion. September 23, 11 am to 3 pm. Open Cockpit Day. Your chance to experience our iconic collection of historic aircraft from the pilot’s seat. Family activities, tours , fire trucks, paint the Hurricane, Linus the Parachute dog, and more. September 28, 5 pm to 8 pm. Servus Free Access Night. Servus will be sponsoring free admission nights on the last Thursday of every month. It's part of their local partnership program to help Albertans learn more about their own community. Food trucks will be on site for opening night. October 28, TBA. Haunted Halloween at Hangar 14. Follow the clues through spooky Hangar 14, complete the scavenger hunt, and collect your rewards. Unleash your inner bat, bandit or barnstormer. Free admission for everyone in costume. Costume competition and (of course) candy. More details coming soon. November 18. 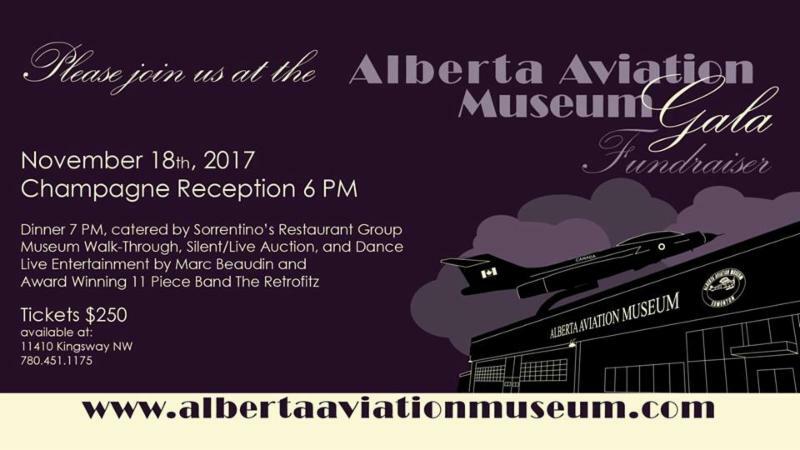 Alberta Aviation Museum Fundraising Gala. Enjoy a walk through the museum to view our revitalization thus far, then join us for an elegant dinner prepared by Sorrentino’s Restaurant Group, a silent and live auction and live entertainment an 11 piece band. Individual tickets are $250 and are eligible for a $50 tax receipt. More information here.